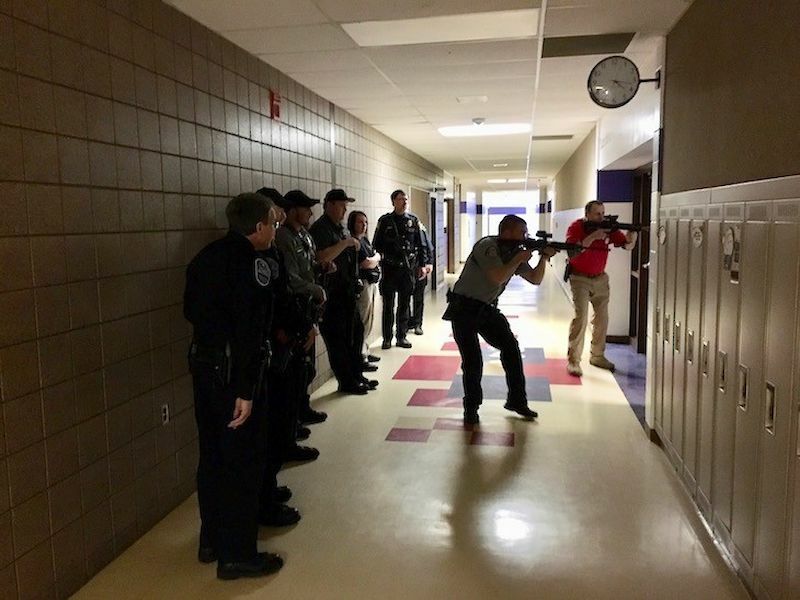 BURNETT COUNTY -- Community police officers from Grantsburg, Siren, Webster, Luck and Balsam Lake participated in “Active Shooter Training” this week at Grantsburg High School. The school was empty while the students were away on spring break. The officers were joined by game wardens from Grantsburg, Webster, and Frederic. The wardens add another line of defense in an emergency situation where every trained and armed officer is needed on the scene as soon as possible. The police officers spent about two hours in the classroom to review the basics and talk about scenarios from previous shootings at schools and other sites. They discussed how to approach a building with a reported active shooter and how to gain entry to a school or other facility which in many cases will be locked down due to today’s exterior door security systems. The officers also focused on how to communicate with school personnel who may have access to camera views inside and outside the school building. 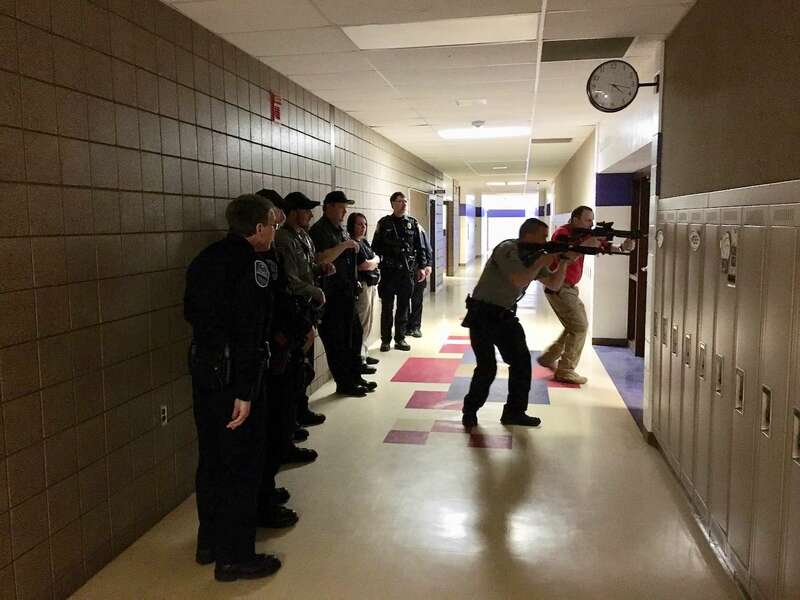 They practiced “clearing” hallways and rooms and learned defensive formations that groups of officers use when moving down a hallway in search of a shooter. David Sohm, a Grantsburg resident and retired St. Paul MN police officer, provided the training through his company called “Mission Critical Concepts.” Sohm has been a law enforcement officer trainer through his business for 25 years. Sohm also provided two recent, free training sessions to area church pastors and staff on how to prepare for a shooter or other disruption at a church. Chief Schinzing said the event at the school provided enhanced active shooter training for the group to refresh and add to their skills. He is planning other trainings during the summer months before school starts next fall. The next training will involve the same officers plus Sheriff Department deputies from Burnett and perhaps other counties. While Sohm led the training, his wife, Christine, talked to a reporter. She said the public often has a mistaken concept of law enforcement work, based on police show on television. “Real life situations are not like TV and the movies,” she said, “and the training process is different. “In real life, the officer faces a wide spectrum of things that could be going on. It’s a slow, methodical, step-by-step process to learn and practice,” she said. Sohm continued, “We focused on tactics and techniques for safely responding to these situations. We also talked about meeting with schools, churches and businesses to start the conversation. The officers will meet each site’s contact persons and learn building layouts, entryways, etc. Sohm also spoke with the officers about handling stress in a tense situation, how to recognize stress and use it to their advantage and not allow it to affect them so they can perform at a high level. 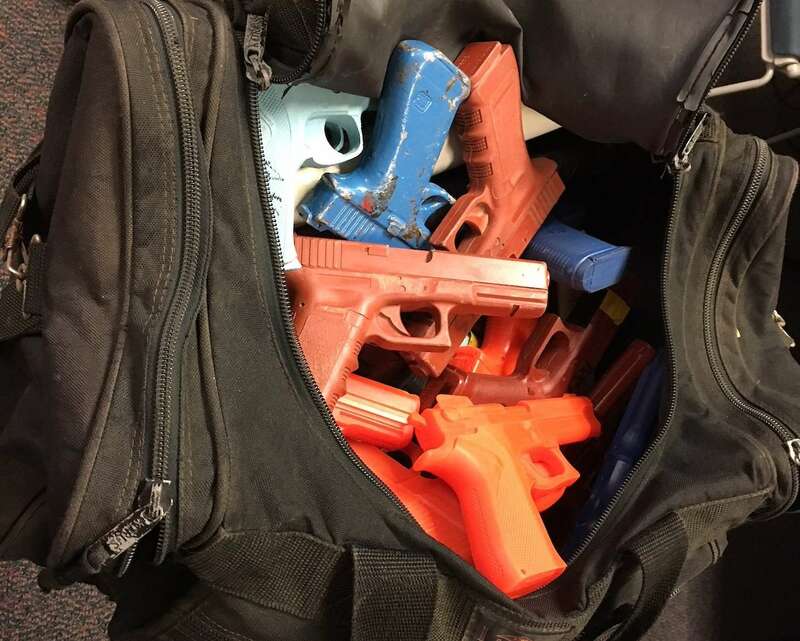 He says he and the officers are planning a full day of training which may include range drills, live fire at the range and “force-on-force” exercises using nine-millimeter paintball rounds “with the goal of acclimating them to the stress. “We are planning for an event we hope and pray never happens,” Sohm said.